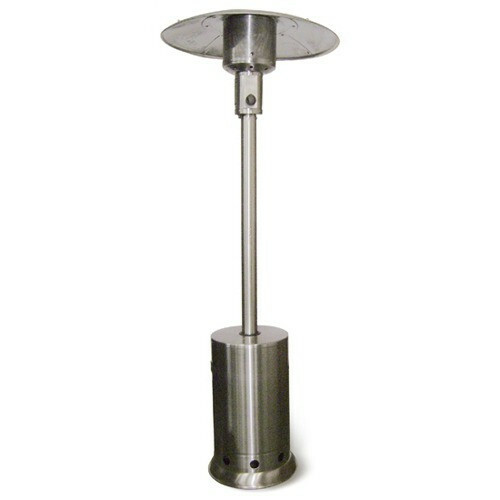 If you need a heater for your patio, consider this L/P Propane Radiant 40,000 BTU Patio Heater. It has an advanced-engineering burner design, with a double heating mantle to provide higher radiant heat output and to give you added longevity to the burner. The stainless-steel frame screen widens the flame for better heat distribution to the mantle surface and the fuel chamber pressurizes and homogenizes the fuel and air mixture for a clean, complete burn. Multi-directional combustion air inlets stabilize the flame in buffeting winds, there are wheels for easy mobility and the water-filled weight ballast provides greater stability. This heater also comes standard with a white factory-tie string cover. It is large enough to accommodate a 30 lb propane tank and it has a 40,000 BTU rating.